Now, that last one tickled me. I happen to agree. We’re to study the Bible because God told us to, and that’s reason enough! But a Bible study has so many benefits for us, for our minds, our hearts, and our souls. Sturdy in knowledge. How can we help our kids to understand God’s Word if we don’t? Sturdy in obedience. How many times would I avoid making a bad choice if I’d JUST read about that this morning? And we know how God sets those “coincidences” up for us! Sturdy in fellowship. How it helps to know that “I’m not the only one who…” You’re not the only one who struggles or who feels a certain way. And the encouragement can mean so much more when it comes from a sister or brother in Christ. Sturdy in our footing. We are children of God. We are beloved. Cherished. The apple of His eye, written on the palm of His hand. When our eyes are in The Word, our feet are on The Rock. 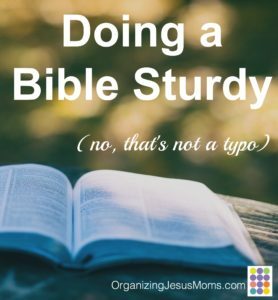 There are so many ways to do a Bible Sturdy. All it takes is a little organization (and a lot of surrender to our Lord). You can join an existing study at your church. You can join an online study. You can start one. May I suggest a few good ones right here on OrganizingJesusMoms.com? I’ve written several Bible Study Series here on the OY blog. They’re intended to be done individually or with a group, just one or two a week. Links to scripture are included. In fact, I’ve tried to make it as easy as possible for you to get started: just click here, choose a study, and click on Day 1. Voila! Even better, check out the two free Group Bible Studies that accompany my books. My books aren’t just about “getting organized,” they’re about living for Christ. They challenge you to apply God’s Word to your whole life. The Group Bible Studies get you even deeper into The Word, and surround you with friends to encourage you on the journey. These are full, publishable Bible Studies, but I’ve chosen to offer them to you for free instead. Don’t let that fool you into thinking they don’t have much value. I worked hard to make them fantastic! I offer them for free because this is a ministry for me, and I just want you to get in there and study. Just start! No matter what study you choose, it will make you sturdy. Turn your eyes to The Word, and plant your feet on The Rock. Tell me, do you feel more sturdy when you’re in the midst of a study? I’d love to read your comments, here or on Facebook.